It’s not a particularly radical concept, and it has been bounced around before. But what President SBY has put in words is, for instance, what Australia is seeking to build with regional partners. If we were asking ourselves, ‘what does it take to be strategic partners with Indonesia?’, SBY has got an easy answer: ‘strategic trust’, as it’s understood in Jakarta. And that’s the beauty of abstraction: you’re off the hook proving it in quantitative terms but you certainly can say you’re working towards it. The President gets further mileage from a term ‘strategic trust’ because it’s entirely consistent with the back catalogue of Indonesia’s regional and international proclamations. Strategic trust is an extension of Indonesia’s foreign policy of ‘dynamic equilibrium’ and its diplomatic approach of having ‘a million friends and zero enemies’. 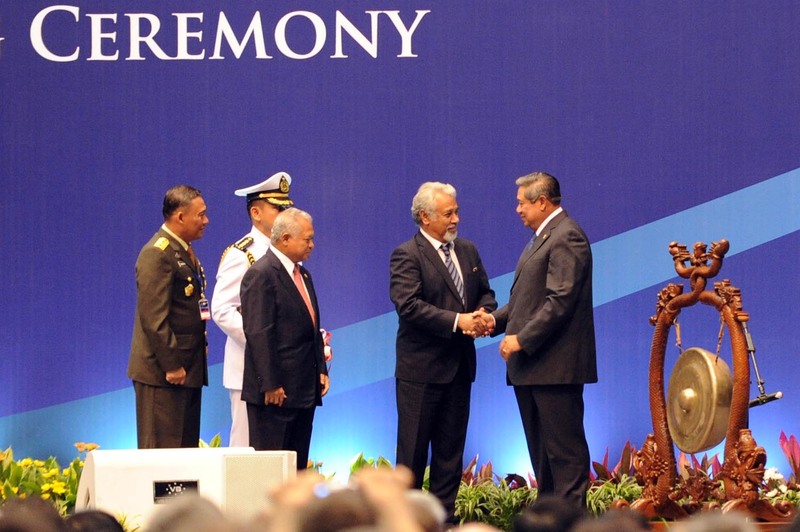 It continues to affirm Indonesia’s desire to be seen as a balancer within the region, not only between global and emerging powers, but also between Asia–Pacific partners. It comes as no surprise that the President would cite opportunities for strategic trust-building as areas where Indonesia has been active diplomatically: in Myanmar’s democratic transition and the South China Sea Code of Conduct. The speech might not be ground-breaking but it’s clever for slipping a diplomatic buzzword into a forum like JIDD. There’s no doubt ‘strategic trust’ was whispered around the JIDD stalls throughout the day and after. Media coverage of the event has played up SBY’s speech like he was ‘dropping the mic’ on strategic thinking. But at the end of the day, ‘strategic trust’ is a term that, if incorporated into our everyday diplomatic parlance and practice with Indonesia, wouldn’t be a bad thing. Image source: President of the Republic of Indonesia. This entry was posted in Uncategorized and tagged Australia, Indonesia, strategic relations by Natalie Sambhi. Bookmark the permalink.